It is great for wedding, party, office decoration,decor, altar, church, corsages, pew bows,reception centerpieces.
? 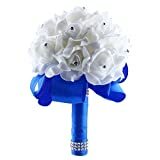 Occasions: It is great for wedding, party, office decoration,decor, altar, church, corsages, pew bows,reception centerpieces. 1.This wildflower bouquet is made of real-looking roses flower. 2.The handle is wrapped in satin ribbon and decorated with Rhinestone. 3.Fashion design, good quality, Hand craft, Rose bouquet for wedding.